"Give a Future" is a UK registered charity which aims to support local projects in Ethiopia, providing vulnerable children with an education to have a better future. Give a Future currently supports one local NGO, that runs a Home for 30 to 40 street children/orphans, a nursery school and a primary school for 260 children, a scholarship program for currently 58 children and community programs for the families of their school children. This program takes each child all the way through to having a job later on, which is the important factor: provide a future for each child- one child at a time. The local NGO has been up and running for 3 years and has grown to support more than 350 children plus their extended families with the help of Give a Future. Two of these children have just been admitted to one of Addis's best secondary schools, the School of Tomorrow. 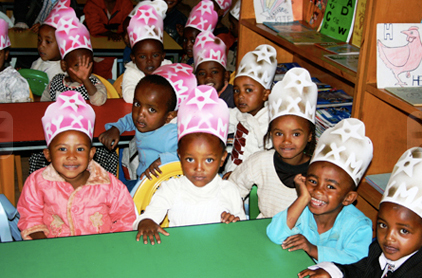 The nursery and primary school are both located in the poorest areas of Ethiopia's capital Addis Ababa. Many children live on one potato or one piece of bread a day. For this reason Give a Future has introduced a lunch program at the schools at the beginning of 2009. All children get one warm, big meal a day and after only 2 months of its existence, attendance rates have gone up considerably, children appear to concentrate much better and look healthier. This also creates 8 jobs where Give a Future has employed 8 mothers of school children, which creates a livelihood for these large families. By helping families in feeding their children, parents have become more committed to the schooling of their children, homework is getting done and gets signed by parents. This project is co-funded by the Nando Peretti Foundation. Give a Future anticipates much higher attendance rates, higher grades, healthier children, fewer drop outs and higher community involvement in the schools. It is further expects healthier communities by employing women who for the first time in their lives receive a regular income which pays for the extended family.